The romance of the Caribbean, the privacy of your own villa, and the luxury of a a full staff including Chef catering to all your needs. 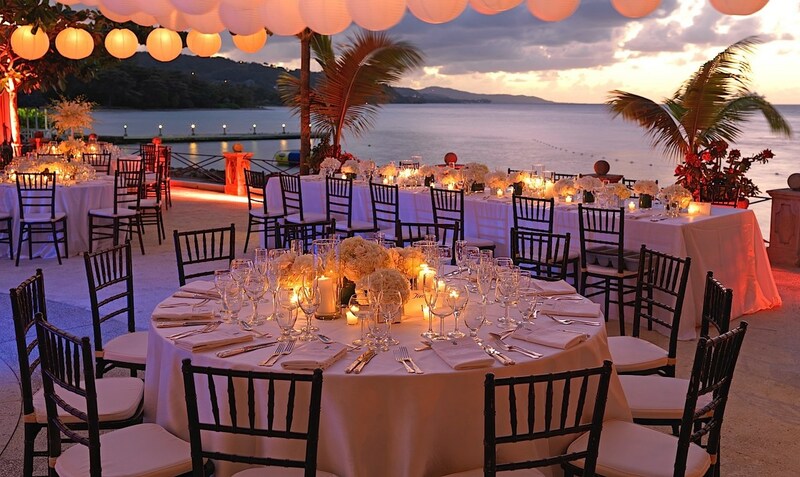 A Jamaica wedding has it all! The north shore of Jamaica is known for its lush green mountains, reef-lined white sandy beaches, and laid back vibe. The region has countless activities for your guests including snorkelling, diving, golf, jungle hikes, coffee & rum plantation tours, or a tour of Bob Marley's hometown (yah, mon!). We have a great deal of experience organizing accommodations for wedding parties, be it a romantic villa for just the couple, or a combination of neighbouring villas for large groups of family and friends. For larger events, we have a strong network of local wedding planners you can employ to help with the planning process. For smaller weddings, you can work directly with our team and the local villa staff to arrange everything for the special day. Nestled on its own sandy beach by the blue waters of Discovery Bay, A Summer Place is a spacious and playful family home. The design is of typical Caribbean gingerbread style with hand-carved fretwork trimming the length of the house. Additional staff required (plus tables, chairs, etc.). $15 surcharge per person. Brilliant contemporary private villa with large heated pool, an excellent staff including top-rated chef, and nearby membership at Round Hill. $15 surcharge applies. Private 5-bedroom cottage nestled into an acre on a gentle hillside that was the original 500-acre plantation of Round Hill Estate. Set in a storybook wooded lot, the villa accommodates couples and families in three bedrooms in the Main House and two more bedrooms in the Cottage just a few yards away. $15 surcharge per person. Located on the beach of Discovery Bay, Coral Cove Villa is a five bedroom, two story villa with a comfy put-your-feet-up signature feeling that allows an at-home, informal, relaxed lifestyle. Coral Cove villa must be rented along with Linga-Awile Cottage. 7 night minimum stay is required at both villas. $15 surcharge per person (outside villa guests only). Built in the 1940‘s by the Duke of Marlborough, Drambuie Estate is a slice of old Jamaica when lively drawing room conversation and gracious service ruled the day in an extraordinary private setting. $15 surcharge per person. One of the most glamorous villas in Jamaica, Endless Summer is a turreted mansion with breathtaking views of the Caribbean Sea. From the porte-cochere, beveled glass doors open to a dramatic 80' columned space. $15 surcharge per person. Flower Hill is one of the most luxurious villas in Montego Bay's, Spring Farm neighbourhood. This Premier 19,000-sq-ft villa sits on 4 beautifully landscaped acres overlooking the Half Moon Beach Resort and Golf Club. Minimum night stay is required: 7 night minimum in High Season & 5 night minimum in Low Season. A $30 per person surcharge applies to outside guests who attend a rehearsal dinner, the wedding reception, brunch or any other hospitality event. An additional $1,000 non-refundable cleaning fee and $5,000 damage deposit apply as well. On a stunning promontory, once the site of an old stone fort, sits a remarkable home named Fortlands Point. From its breathtaking location on the tip of the peninsula, the commanding view encompasses the turquoise water of Discovery Bay on one side and the deep blue Caribbean Sea on the other. $15 surcharge per person. $1000 damage deposit. Goat Hill sits on a remarkable site, located specifically to benefit from the spectacular view of the Caribbean Sea and the most favorable trade winds day and night. The east view captures the sunrise, Montego Bay and the Great River ~ the west view is an equally lovely vista toward Round Hill, the Caribbean Sea and the sunset. $1,000 surcharge for first 40 guests. $15 per person surcharge for 41-80 guests. JUS' PARADISE is an aptly-named private villa located in a gated residential area of upscale homes in the lush hills of Rose Hall. This well-located home sits between two renowned golf courses: the challenging White Witch and championship Cinnamon Hill course. Five minutes west is the famous Half Moon course. This 3-bedroom casual cottage shares a delightful waterfront site with its sister property, Coral Cove Villa, on the clear waters of Discovery Bay. Linga-Awile sits on a lovely, long, large lawn. Beyond the lawn and swimming pool is its sugary white sand beach with two thatched roof umbrellas for shade. Linga-Awile Cottage must be rented along with Coral Cove Villa. 7 night minimum stay is required at both villas. $15 surcharge per person (outside villa guests only). Nutmeg is a charming 6 bedroom villa in the upscale residential neighbourhood of Spring Farm ~ just five minutes from three world-class golf courses, designer shops, bars, restaurants and beaches. $15 surcharge per person. Pavilion is an exquisite villa privately located at the end of a cul-de-sac with magnificent views of the Caribbean Sea to the north and a tranquil 10-mile view of the mountains to the south. It is spacious, quiet, peaceful and beautiful. $15 surcharge per person. SCOTCH ON THE ROCKS is a charming turquoise villa overlooking the Caribbean Sea. Full house rental and 7 night minimum stay required. Prepaid gratuity required. Wedding planner not required but recommended. $15 surcharge per person. On its own sugary white sand beach lapped by the clear turquoise waters of Discovery Bay sits the charming home Sea Grapes. The translucent azure waters here are excellent for swimming and kayaking. Surrounding the swimming pool is a spacious grassy lawn, wonderful for children and games. $15 surcharge per person. Drive through the impressive entrance gates with their tall stone columns to enter this unique and lovely home, beloved by the families who return year after year. Full house rental and 4 night minimum stay required. $15 surcharge per person. SERENITY is one of the most beloved and often revisited villas on Jamaica's beautiful north coast. Its prize location is a waterfront acre 8 miles west of Montego Bay. Grounds include a tennis court, basketball hoop and heated pool. $15 surcharge per person. The morning sun has turned the sea and the dew on the palm trees to silver. The non-stop trade winds waft through the rooms of the villa and the aroma of fresh-baked bread works its way from the kitchen to my bedroom window. 7 night minimum stay required. Weddings must be arranged with a wedding planner. Silent Waters is one of the most glamorous private homes in the Caribbean. It is distinguished by world-class architecture and design, breathtaking location, and exquisite accommodations and service. All 5 main villa suites and the owner's villa will accommodate 18-20 guests. A 2-night minimum reservation is accepted in low season and the weekly rate will be prorated accordingly. All special events held at Silent Waters Villa are subject to a US$3,000 facility rental fee. This fee will be waived for guests satisfying a minimum rental requirement of US$16,240 in low season and US$21,910 in high season. 20 guests are allowed for plated sit-down dinners, 54 guests are allowed for buffet sit-down dinners and 150 guests are allowed for cocktail parties. On its own sugary white sand beach lapped by the turquoise waters of Discovery Bay sits the exquisite home Sugar Bay. Interiors are distinguished by elegant custom-designed furniture, color-washed walls, gleaming breadnut floors, and fascinating objets d`art from around the world. 7 night minimum stay is required. $15 surcharge per person. $2000 damage deposit. 6,000-square-foot private villa on 5 acres with magnificent views of the Caribbean Sea. After sunset, the view transforms from brilliant blue water to the mesmerizing beauty of the sea at night, glimmering with reflections of cruise ships and the romantic night lights of Montego Bay nine miles away. $350 event fee plus $15 surcharge per person. Located on a wide sandy beach, Sweet Spot is like a pretty jewel box next to the sea. Its remarkable location is the best of all worlds a 6,000-square-foot private home with a huge lawn and beach ~ just yards from the Jewel Runaway Bay golf pro shop which offers discounted greens fees to Sweet Spot guests. $15 surcharge per person. Maximum guests: 30 (outside catering required for guests; $2,000 damage deposit for events). On 220 private acres of former banana and coconut plantation stretching from mountain to sea, Wild Orchid is a glamorous and luxurious hideaway in the tropics. Event fees based on 5-night minimum stays: $1,000 for 1-50 guests, $1,500 for 51-75 guests, $2,000 for 76-100 guests, $2,500 for 101-200 guests and $3,000 for 201-300 guests. Please request a quote for more than 300 guests. One-day event fees during Low Season: US$1,250 for 1-50 guests, US$3,125 for 51-75 guests and US$3,750 for 76-100 guests. Please request a quote for more than 100 guests. One-day events during High Season attract an additional 20% Surcharge. Windsong is an exquisite and very private home just minutes from Round Hill. Designed by noted architect Kasimir Coribut, the site benefits from spectacular views day and night and the most favorable tradewinds. The east view captures the sunrise and Montego Bay ... the west view is an equally lovely vista of Round Hill, the sea and the sunset. $15 surcharge per guest applies.